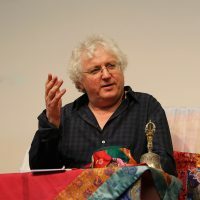 ​In our first major event of 2017, Lama Jampa continued his survey of the Buddhist philosophical schools in chapter 4 of his book, ‘Rain of Clarity’. Over 130 people heard how the view of a permanent self is the root of suffering and delusion and actually there is nothing to fear in letting go of this idea as this solid, truly existent self was never there in the first place! We then continued our search for the self in all phenomena, using analytical techniques described by such great Indian masters as Chandrakirti.